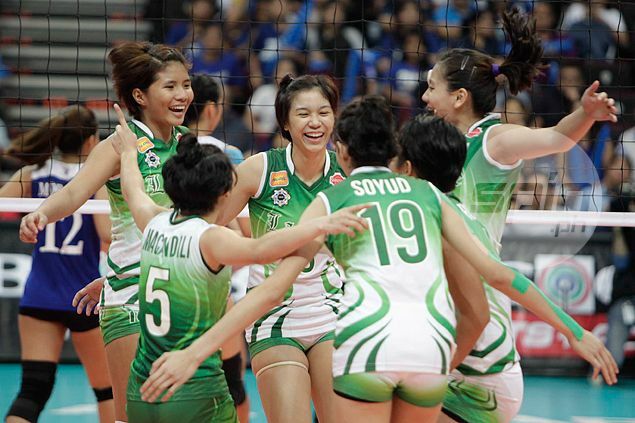 THERE won’t be a La Salle Lady Spikers homecoming in the Shakey’s V-League. School athletic director Nongnong Calanog confirmed the team is not joining the pioneering league’s collegiate conference that kicks off on July 4, contrary to earlier pronouncements. The La Salle official said the school's men’s team will definitely see action in the Spikers’ Turf but said an anticipated return to the women's tournament after a seven-year absence is not pushing through. “We are only joining in the men’s division, since the women’s team has other commitments already,” said Calanog, explaining that the Lady Spikers are committed to play in the Philippine National Games as well as games in the provinces. “We have already committed to play in the Philippine National Games and other invitations in the province,” he added. The organizing Sports Vision had earlier included La Salle in the 12-team lineup for the tournament, stirring excitement among fans over the possibility of the Lady Spikers bringing their rivalry with the Ateneo Lady Eagles to the V-League. However, sources said the planned V-League comeback hatched by team management encountered opposition from the Lady Spikers coaching staff. Prior to taking a leave of absence, La Salle won three successive V-League titles - Second Conference of Season 1 in 2004, First Conference of Season 2 in 2005, and First Conference of Season 3 in 2006. The Lady Spikers played a total of seven conferences in the league and last saw action in the Second Conference of Season 5 where they finished third.